These four McDonald's workers shared their monthly budgets to show how their spending stacks up to the controversial McDonald's sample. A budget planning guide from McDonald's for its employees, shown above, caught flak this past week for being out of touch. For starters, it didn't account for food and gasoline. The second line on the sample budget leaves room for income from a second job, which many called an admission by the fast food giant that its workers can't live on its wages alone. McDonald's (MCD) said in a statement that the sample is a generic example and is intended to provide a general outline of what an individual budget may look like. 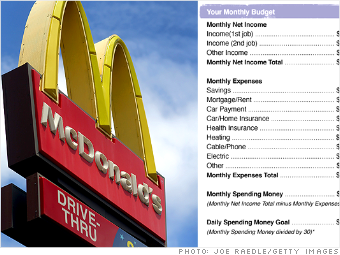 Four real McDonald's workers shared their budgets with us, shedding light on how far their wages actually go. Pay off student loans or save: Which comes first?